Due to the water shortage, society is becoming aware of the importance of recycling water. The daily household use per person is 129 liters and half of that comes from the shower and the toilet. Besides reducing the use, we can opt for recycling systems to improve consumption. You can save 90.000 liters of water every year per family with a grey water recycling system. Grey water are thouse coming from showers, bath and washbowl. The recycled water is not drinking water, but you can use this water for different uses: washing machine, wc cistern, garden irrigation, and so on. Waters are cleaned with a reliable quality, meeting the international standars. Easy to install in the inferior plants of the house to facilitate the liquids flowing. This gray water recycling system is based on a filtering system without chemichals, so it is completely odorless. It is available in different sizes, for different consumption needs. Minimal cost of installation. Totally automatic working thanks to the central control unit and the autowashing system. Process doesn't employ chemichal substances, is silent and doesn't produce scents. It uses long life componentes and doesn't have chemichals. Energy consumption reaches 1,2 kWh/m3. Taking into account that water price is bigger every day, this gray water recycling system amortizes very fast. 1. Filtering is made as water comes into the tank. Bigger particles are picked up mechanically and expelled directly into the outflow. 2. In the recycling tanks, a biologic treatment decomposes dirt particles. Treated water is pumped each three hours into the next phase. 4. In case that needed water is bigger than the stored one, system allows to incorporate drinking water of the water network to warranty supply. Greywater recycling is done by reusing the water from sinks and showers from around the house. After a laser treatment, we can exploit this natural resource to wash clothes, wash the car or mop the floor and it can also be used to fill the toilet tank and watering the garden. Such an installation can save up to 90,000 liters of water per year,in a single household. 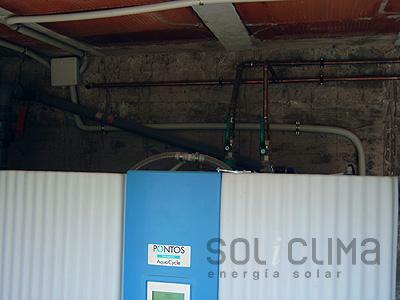 To be able to recycle water, it´s necessary to have two separate hydraulic circuits, and it´s strongly recommended having it installed during the construction of the house, to avoid the work that, installing these hydraulic circuits afterwards, would create.